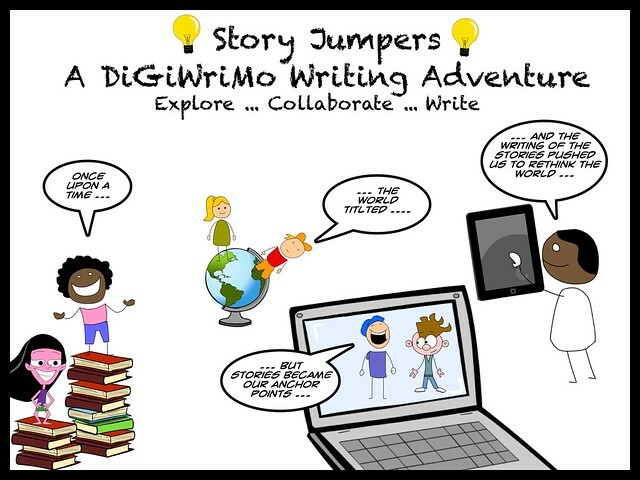 This was one of the coolest and oddest collaborations that went on during Digital Writing Month: the Storyjumpers Project. It is an “exquisite corpse” story in which a story unfolded piece by piece across 26 blogs over 30 days. Thankfully, our friends at the Vermont Young Writers Project did an amazing and entertaining summary of the entire shebang because following the story from blog to blog got a little … eh .. messy as time went on and twists and turns became a regular facet. Then, they wrote the last chapter before November 30 ended. The infographic above is my attempt to make some sense of what happened beyond the story itself. 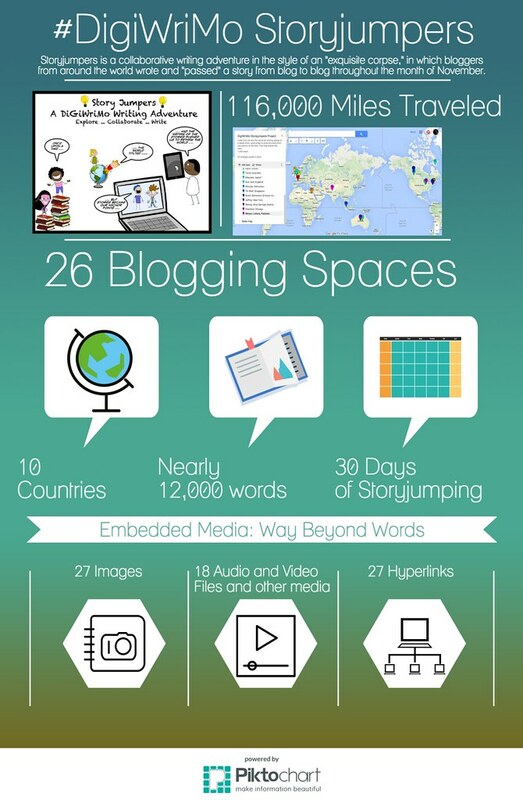 Plus, we had done some exploration around using infographics in Digital Writing Month, so it seemed appropriate to try to use one to explain the Storyjumper Project. I’d be interested in pulling the entire story together into one single document to share. That’s for another day. Right now, all of the text runs about 50 pages in a Google Document. And to think … it all started with a single Tweet …. This entry was posted in Digiwrimo, Slice of Life. Bookmark the permalink. What a cool project, friend. I’m not surprised. I could use a new digital project. Any suggestions?